Today’s luxury bathrooms are all about total relaxation. This increasingly popular remodeling style typically involves several upgrades, adding value by making basic, functional bathrooms much bigger and luxurious. For starters, a luxury bathroom remodel is not complete without a soaking tub and steam room. In fact, for a true spa-like experience, many homeowners are replacing old hot tubs (circa 1980s) with a quiet, peaceful soaking tub. This style of bathtub is deep and insulated for complete relaxation. Equally as popular are steam rooms – a great addition when you need to unwind and rest after a stressful day. The best part: they can be easily configured into any bathroom with a few simple ceiling and floor alterations. Some homeowners are starting to discover the benefits of heated floors to add to their luxury bathroom. Think about it: nothing is better than stepping out of the shower on a cold winter day onto toasty tile floors. Heated floors are pretty easy to install thanks to new radiant floor heating technology. 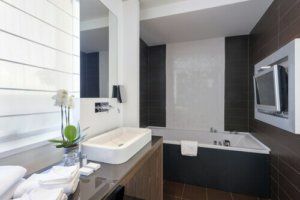 One big trend in Phoenix luxury bathrooms is the addition of flat screen TVs and music speakers. Flat screens are being added to the walls, the most convenient location for homeowners to enjoy the ultimate in relaxation. Speaker systems are also trending now. In fact, with just the right technology, you can listen to your favorite music to help you further relax. Some homeowners are getting rid of their bathtubs entirely. Why? To widen their showers and create bigger spa-like settings, including shower benches. In fact, opening up and expanding the shower area is becoming a major luxury trend. It makes any bathroom feel more like a real visit to the spa. A successful bathroom remodeling project can have a major impact on your home. It can even help you enjoy your own spa-like atmosphere right in the comfort of your own property. For more information on luxury bathrooms in Phoenix, contact us today.